Runtime: 2 hr. 8 mins. When it comes to fantasy and soft science fiction, the concept of "world building" is at least as important as narrative and character development. "World building" refers to the ability of an author or filmmaker to craft a new and amazing vista in which his/her story can transpire, using every available tool to achieve the aim of making the setting believable and "lived in" rather than pedestrian and forgettable. 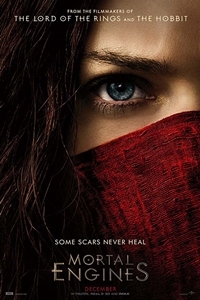 Mortal Engines, the movie adaptation of Philip Reeve's YA novel, represents one of the most impressive examples of "world building" in recent years, surpassing such contenders as Valerian, Cloud Atlas, and even the recent Star Wars episodes. Blessed with a well-paced (although sometimes too frenetic) story that has a beginning, middle, and end, Mortal Engines might have been well-placed to start a new franchise had outside factors not conspired against it. One of the common gripes with movies like this - that they sacrifice the "single movie" story concept in order to facilitate a multi-part arc (that, more often than not, is never given the opportunity to play out, as fans of Divergent will attest) - doesn't apply here. Screenwriters Peter Jackson, Philippa Boyens, and Fran Walsh, who are no strangers to movie series, ensure that Mortal Engines remains self-contained while still allowing for the possibility of future installments. (Reeve wrote a four-book set with these characters.) Unfortunately, the collapse of the YA motion picture market coupled with Universal's decision not to aggressively publicize Mortal Engines, has all-but-assured that this will be a one-and-done affair. And, while I would enjoy seeing more adventures with these characters, I left the theater satisfied with the story I had seen and the "world building" that brings it to life. The time frame is perhaps 1000 years in the future. As a result of a cataclysmic "60-minute war" that laid waste to the planet, a steampunk post-apocalyptic future has arisen in which huge, mobile cities roam the barren landscape looking for smaller settlements to "devour." The movie opens with a special effects bonanza as the greatest of all the cities, London, commanded by Mayor Magnus Crome (Patrick Malahide), chases down the mining settlement of Salzhaken. Shortly thereafter, one of the refugees from Salzhaken, a young woman named Hester Shaw (Hera Hilmar), attempts to assassinate the head of the Guild of Historians, Thaddeus Valentine (Hugo Weaving). The attack is foiled by one of Valentine's apprentices, Tom Natsworthy (Robert Sheehan), who chases Hester through the burning wreckage of Salzhaken as London consumes it for energy. The chase ends with both Hester and Tom being ejected from the ship when Valentine reveals himself not to be the genial, unassuming man he seems to be. Out in the Great Hunting Ground, Hester and Tom face a number of challenges, not the least of which is learning to trust one another. They join forces with Anti-Traction League agent Anna Fang (Jihae) in an attempt to stop Valentine before he is able to make a death-weapon active. And Hester becomes the focal point of a hunt by the undead Stalker Shrike (Stephen Lang), who claims she has broken a promise. If Mortal Engines seems at times like Star Wars, it's not a coincidence. But that's not because Reeve and the screenwriters were overly influenced by George Lucas' movies (although it would be naïve to assume there's not some of that) but because, as has often been discussed when analyzing Lucas' storytelling, common tropes and mythologies form the basis not only of Star Wars but many epic stories. The film's look, shaped under the direction of fist-time director (and Jackson protégé) Christian Rivers, draws on various familiar steampunk sources from Mad Max to The City of Lost Children to a few of Terry Gilliam's adventures, while maintaining its own identity. The special effects are indeed special and deserve to be seen on a big screen (the bigger, the better). This is one of those rare films when wall-to-wall CGI doesn't result in an overdose. It's increasingly rare that new properties are accorded this sort of big, splashy treatment. In today's climate, nearly every spectacle is either a sequel or a remake. Mortal Engines isn't revolutionary nor does it "color outside the lines" in terms of its narrative or character interaction. But it succeeds in telling an engaging tale with sufficient flare and drive that it never threatens to overstay its welcome. As shepherded by filmmakers with a penchant for visual storytelling, Mortal Engines is two hours well-spent.